This compilation celebrates the birthday of Zacarias William Ulbrich, the mastermind behind this otherwordly project named Utu, who unfortunately passed away last year after a long battle with cancer. He will be greatly missed and always remembered for his friendly heart, but also by his amazing music. Utu has left us a whole bunch of unreleased tracks which were meant to be available to the people. Although Zakk believed in free music, we did make a Bandcamp page with his full discography, which is open for direct donations to his family. 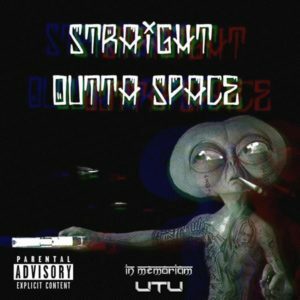 Straight Outta Space was Zakk’s own compilation concept, and the artwork had already been started during his lifetime, so we decided to finish his idea with the music from some of his friends and all of his unreleased material. Utu‘s sound can be described as energetical hypno-ecstatic space funk that will definitely take you into the journey full of wonders. So let the deep world of UTU live forever! MP3 Download | FLAC Download | WAV Download · Download count: 10,784.